Instruction of the recruit.— 1. The instructors must be clear, firm and concise in giving their directions. They must allow for the different capacity of the recruits, and be patient where endeavour and good-will are apparent. Recruits should fully comprehend one part of their drill before they proceed to another. When first taught their positions, they should be properly placed by the instructor; when more advanced, they should not be touched, but taught to correct themselves when admonished. They should not be kept too long at any one part of their exercise. Marching without arms should be intermixed with the rifle instruction. Duration of Drills, &c.—Short and frequent drills are preferable to long lessons, which exhaust the attention of both the instructor and recruit. The recruits should be moved on progressively from squad to squad according to their merit, so that the quick intelligent soldier may not be kept back by men of inferior capacity. To arrive at the first squad, should be made an object of ambition to the young soldier. Mutual Instruction.—A system of mutual instruction will be practiced amongst the recruits; it gives the young soldier additional interest in his drill, and prepares him for the duties of a non-commissioned officer. Recruits should, in turn, be called out to put their squad through the exercises which have been practised, and encouraged to correct any error they may observe. Lists of those who show talent for imparting instruction should be kept, for reference, by the captains, and in the orderly room. Words of Command.—1. Every command must be loud, and distinctly pronounced, so as to be heard by all concerned. Every command that consist of one word must be preceded by a caution: the caution or cautionary part of a command, must be given slowly and distinctly; the last or executive part, which, in general, should consist only one word or syllable, must be given sharply and quickly; as Company—Halt: Half right—Turn. A pause of slow time will invariably be made between the caution, or cautionary part of a command, and the executive word. The words given in the Extension Motions and Balance Step (Ss. 5, 11) must be given sharply, or slowly and smoothly, as the nature of the motion may require. When the last word of a caution is the signal for any preparatory movement, it will be given as a n executive word, and separated from the rest of the command by a pause of slow time; thus Right—Form. Quick—March, as though there were two separate commands, each with its caution and executive word. When the men are in motion, executive words must be completed as they are commencing the pace which will bring them to the spot on which the command has to be executed. The cautionary part of the word must, therefore, be commenced accordingly. Officers and non-commissioned officers should frequently be practiced in giving words of command. It will be found a good plan to practise several officers or non-commissioned officers together in giving words of command, first in succession, then simultaneously; the time and pitch being first given by the instructor. If necessary, the squad may consist of two such lines of men, in which case the men in the second line will cover the intervals between the men in the first, so that in marching they may take their own points, as directed in S. 10. Recruits should in the first instance be placed by the instructor without dressing; when they have learned to dress, as directed in S. 3, they should be taught to fall in, as above described, and then to dress and to correct their intervals: after they have been instructed as far as S. 22, they may fall in in single rank, and then, if required to drill with intervals, be moved as directed in S. 24. Recruits formed into a squad should be directed to observe the relative places they hold with each other; while resting between exercises they should be permitted to fall out and move about; they should be instructed on the word “Assemble” to fall in as they stood at first. This should be constantly practiced. Recruits will, if possible, be instructed singly as far as S. 22. The exact squareness of the shoulders and body to the front is the first and great principle of the position of a soldier. The heels must be in line and closed; the knees straight; the toes turned out so that the feet may form an angle of 45 degrees; the arms hanging easily from the shoulder, the hand open, thumb to the front and close to the forefinger, fingers lightly touching the thigh; the hips rather drawn back, and the breast advanced, but without constraint; the body straight and inclining forward, so that the weight of it may bear principally on the fore fart of the feet; the head erect, but not thrown back, the chin slightly drawn in, and the eyes looking straight to the front. When the soldier falls in for instruction, he will be taught to place himself in the position above described. N.B.– The words in the margin printed in italics are the commands to be given by the instructor. Soldiers will first be taught the motions of standing at ease by Numbers, then judging the time. Caution, – Stand at Ease, by Numbers. On the word One, raise the arms from the elbows, left hand in front of the centre of the body, as high as the waist, palms upwards; the right hand as high as the right breast, palm to the left front; both thumbs separated from the fingers and the elbows close to the sides. On the word Two, strike the palm of the right hand on that of the left, drop the arms to their full extent, keeping the hands together, and passing the right hand over the back of the left as they fall; at the same time draw back the right foot six inches, and slightly bend the left knee. When the motions are completed, the arms must hang loosely and easily, the fingers pointing towards the ground, the right thumb lightly held between the thumb and palm of the left hand; the body must incline forward, the weight being on the right leg, and the whole attitude without constraint. On the word Attention, spring up to the position described in S.1. Caution, – Stand at Ease, judging the Time. On the word Ease, go through the motions described in the standing at ease by Numbers, distinctly but smartly, and without any pause between them. If the command Stand at—Ease is followed by the word Stand Easy, the men will be permitted to move their limbs, but without quitting their ground, so that on coming to Attention no one will have materially lost his dressing in line. If the men are required to keep their dressing accurately, they should be cautioned not to move their left feet. On the word Squad being given to men standing easy, every soldier will at once assume the position of standing at ease. 3. Dressing a Squad with Intervals. On the words Eyes– Right, the eyes will be directed to the right, the head being slightly turned in that direction. On the word Dress, each soldier, except the right-hand man, will extend his right arm, palm of the hand upwards, nails touching the shoulder of the man on his right; at the same time he will take up his dressing in line by moving, with short quick steps, till he is just able to distinguish the lower part of the face of the second man beyond him; care must be taken that he carries his body backward or forward with the feet, keeping his shoulders perfectly square in their original position. On the word Eyes– Front, the head and eyes will be turned to the front, the arms dropped, and the position of the soldier as described in S. 1, resumed. Dressing by the left will be practiced in like manner. In the first of all the following motions, the foot is to be carried back, or brought forward, without a jerk, the movement being from the hip; so that the body may be kept perfectly steady until it commences to turn.In going through the turnings, the left heel must never quit the ground; but the soldier must turn on it as on a pivot, the right foot being drawn back to turn the body to the right, and carried forward to turn it to the left: the body must incline forward, the knees being kept straight. On the word Turn, place the hollow of the right foot smartly against the left heel, keeping the shoulders square to the front. On the word Two, raise the toes, and turn a quarter circle to the right on both heels, which must be pressed together. On the word Turn, place the right heel against the hollow of the left foot, keeping the shoulders square to the front. On the word Two, raise the toes, and turn a quarter circle to the left on both heels, which must be pressed together. On the word Turn, place the ball of the right toe against the left heel, keeping the shoulders square to the front. On the word Two, raise the toes, and turn to the right about on both heels. On the word Three, bring the right foot smartly back in line with the left. On the word Turn, place the right heel against the ball of the left toe, keeping the shoulders square to the front. On the word Two, raise the toes, and turn to the left about on both heels. On the word Three, bring up the right foot smartly in a line with the left. On the word Turn, draw back (or advance) the right foot one inch. On the word Two, raise the toes and turn half right (or left) on both heels. Three-quarters– Right (or Left) about– Turn. Make a three-quarters turn in the given direction in the same manner as turning about. When the soldier has previously turned about, he will always front by the right about. But if he has turned to the three-quarters right about, he will front by the three-quarters left about; and vice versa. At squad drill with intervals, the turnings will always be done by Numbers, except when the word Front is given, in which case the soldier will judge the time, which must be a pause of slow time after each motion. The Extension Motions are not reprinted in this version of the Field Exercise Book. Caution, –Right-hand Salute, by Numbers.Soldiers will be practiced in saluting, first by Numbers, then judging the Time; being turned to the right for the right-hand salute, to the left for the left-hand salute. On the word One, bring the right hand smartly, but with a circular motion, to the head, palm to the front, point of the forefinger one inch above the right eye, thumb close to the forefinger; elbow in line, and nearly square with the shoulder; at the same time slightly turn the head to the left. On the word Two, let the arm fall to the side, and turn the head to the front. Caution, –Right-hand Salute, judging the Time. On the word Salute, go through the two motions described in One and Two. Soldiers will be taught to salute with the left hand in like manner. A soldier, if standing still when an officer passes, will turn towards him, come to attention, and salute when the officer is four paces from him; he will lower the hand after a pause of six paces in quick time: if sitting, he will rise, stand at attention, and salute. When a soldier addresses an officer, he will salute making a pause of slow time between the first and second motions, and halt two paces from him. When walking, soldiers will salute an officer as they pass him, commencing their salute four paces before they come up to him. When a soldier passes an officer, he will salute on the forth pace before reaching him, and lower the hand on the forth pace after passing him. Soldiers should be practiced in marching two or three together, round the drill ground, saluting points placed on either side of them, care being taken that they always salute with the hand further from the point saluted: when several men are together, the man nearest the point will give the time. In slow or quick time the length of pace is 30 inches, except in “stepping out,” when it is 33 inches, and in “stepping short,” when it is 21. In “double time” the length of pace is 23 inches. The length of the side step is 12 inches. N.B.—When a soldier takes a single pace to clear or cover another, as in forming four deep, which will be hereafter described, the pace will be 24 inches. In slow time, 75 paces are taken in a minute. In quick time, 116 paces, making 96 yards 2 feet in a minute and 3 miles 520 yards in an hour. In double time, 165 paces, making 151 yards 9 inches in a minute, and 5 miles 275 yards an hour. S.9. The Drum, Plummet, and Pace Stick. No recruit, or squad of recruits, must be taught to march without the constant use of drum and pace stick. The drum will first beat the time in which the men are to march when the squad is halted: then, from time to time, when it is in motion. While the drum is beating at the halt, the men will give their whole attention to the cadence; when it ceases, the instructor will at once put the squads in motion. In order to ascertain whether the time is beaten correctly, a pendulum or a “Plummet” must be used. A variety of pendulums have been constructed for this purpose. When no pendulum is at hand, a plummet can readily be made by suspending a spherical ball of metal by a string, the length of which, measured from the point of suspension to the centre of the ball, must be as follows for the different degrees of march. Thus arranged, the plummet will swing the exact time required. String being liable to stretch, the correctness of the plummet should be frequently tested by reference to a watch. The length of pace in marching will be corrected with the pace stick, the accuracy of which should occasionally be tested by measurement. In marching, the soldier must maintain the position of the head and body, as directed in S. 1. He must be well balanced in his limbs. His arms and hands must be kept steady by his sides; care being taken that the hand does not partake of the movement of the leg. The movement of the leg must spring from the haunch, and be free and natural. Both knees must be kept straight, except while the leg is being carried from the rear to the front, when the knee must necessarily be a little bent, to enable the foot to clear the ground. The foot must be carried straight to the front, and, without being drawn back placed softly on the ground, so as not to jerk or shake the body; the toes turned out at the same angle as when halted. Although several men may be drilled together in a squad with intervals, they must act independently and precisely as if they were being instructed singly. Each soldier must be taught to march in a straight line, and to take a correct pace, both as regards length and cadence, without reference to the other men of the squad. Before the squad is put in motion, the instructor will take care that the men are square individually and in correct line with each other. Each soldier must be taught to take up a straight line to his front, first by looking down the centre of his body between his feet, then fixing his eyes upon some object on the ground straight to his front at a distance of about 100 yards; he will then observe some nearer point in the same straight line, such as a stone, tuft of grass, or other casual object, about 50 yards distant. The object of the balance step is to teach the soldier the free movement of his legs, preserving at the same time perfect squareness of the shoulders, and steadiness of body; no labour must be spared to attain this object, which forms the very foundation of correct marching. The instructor must be careful that the soldier keeps his body well forward, and his shoulders perfectly square during these motions. Caution.—Balance Step, commencing with the Left Foot. On the word Front, the left foot will be raised from the ground by a slight bend of the knee, and carried gently to the front, without a jerk, the knee being gradually straightened as the foot is carried forward; the foot to be turned out at the same angle as when halted, the sole parallel to and clear of the ground, the heel just in advance of the line of the right toe. On the word Rear, given when the body is steady, the left foot will be brought gently back without a jerk, till the toe is in line with the right heel, clear of the ground; the left knee to be a little bent. When steady, the words Front and Rear will be repeated several times, and the motions performed as above described. On the word Halt, which should always be given when the moving foot is in rear, that foot will be brought to the ground in line with the other. The instructor will afterwards make the soldier balance upon the left foot, carrying the right foot forward and backward. Standing on one leg and swinging the other backward and forward without constraint, is an excellent practice. On the word Front, the left foot will be carried to the front, as described in No. 1. 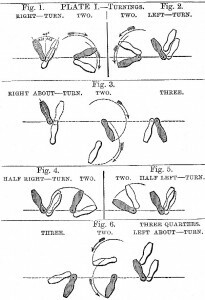 As soon as the men are steady in the above position, the word Forward will be given, on which the left foot will be brought to the ground at 30 inches difference from heel to heel, toes turned out at the same angle as when halted; and the right foot will immediately be raised and held extended to the rear, toe in line with the left heel, the right knee to be slightly bent. Great care must be taken that the toes remain throughout at the proper angle; that the body accompanies the leg, and that the inside of the heel is placed on the imaginary straight line that passes through the points on which the soldier is marching; that the body remains straight, but inclining forward; that the head is erect, and turned neither to the right nor left. On the word Front, the right foot will be brought forward; and so on, alternately. On the word Halt, which should always be given when the moving foot is to the front, that foot will complete its pace, and the rear foot will be brought up in line with it. The three most important objects in this part of the drill are cadence, length of pace, and direction. The time having been given on the drum, on the word March, the left foot will be carried 30 inches to the front, as directed in S. 10: the right foot will then be carried forward in like manner, and so on alternately. The soldier must be thoroughly instructed in this step, as an essential preparation for arriving at accuracy in the paces of greater celerity. On the word Halt, the moving foot will complete its pace, and the rear foot will be brought up in line with it. It is a general rule that after the word Halt, the men, whatever their position, will stand perfectly steady, unless ordered to Dress. When marching in slow time, on the words Step – Out, the soldier will lengthen his pace to 33 inches by leaning forward a little, but without altering the cadence. This step is used when a slight increase of speed, without an alteration on cadence, is required; on the words Slow – Step, the pace of 30 inches will be resumed. On the words Step – Short, the foot advancing will finish its pace, and afterwards each soldier will take paces of 21 inches until the word Forward is given, when the usual pace of 30 inches will be resumed. This step is used when a slight check is required. On the words Mark – Time, the foot then advancing will complete its pace, after which the cadence will be continued, without advancing, by raising each foot alternately about three inches from the ground, keeping the body steady; on the word Forward, the usual pace of 30 inches will be resumed. From the halt, the word of command will be Slow Mark – Time. Step Back, Slow – March. In stepping back, the pace will be 30 inches. Soldiers must be taught to move straight to the rear, preserving their shoulders square to the front and their bodies erect. On the word Halt, the foot in front will be brought back square with the other. A few paces only of the step back can be necessary at a time. 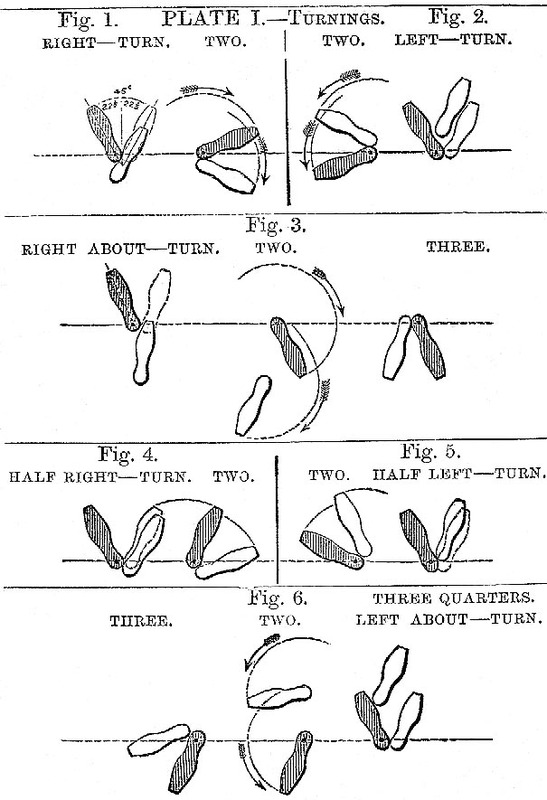 To change feet in marching, the advancing foot will complete its pace and the ball of the rear foot will be brought up quickly to the heel of the advanced one, which will instantly make another step forward, so that the cadence will not be lost; in fact, two successive steps will be taken with the same foot. This may be required when any part of a battalion, or a single soldier, is stepping with a different foot from the rest. The cadence of the slow march having become perfectly familiar to the soldier, he will be taught to march in quick time. The time having been given on the drum, on the word March the squad will step off together, with the left foot, observing the rules given in S.10. When a soldier is perfectly grounded in marching in quick time, all the alterations of step, and the marking time, and changing feet, laid down for the slow march, will be practiced in quick time. The time having been given on the drum, on the word March, the men will step off together with the left foot; at the same time raising their hands as high as the waist, carrying back the elbows and clenching the fists, the flat part of the arm to the side; the head to be kept erect, and the shoulders square to the front; the knees being more bent, and the body more advanced, than in the other marches. The instructor will be careful to habituate the soldier to the pace of 33 inches. As in S. 13, at the same time dropping the hands and extending the fingers. The soldier will be taught to mark time in the double cadence in the same manner as in slow and quick. 21. The Side or Closing Step. Soldiers will first be taught the side step by numbers, then judging the Time. Caution, – Right Close, by Numbers. On the word One, the right foot will be carried 12 inches to the right, the shoulders and face being kept perfectly square to the front, and the knees straight. On the word Two, the left foot will be closed smartly to the right foot, heels touching. The word One being repeated, the right foot will be carried on 12 inches as before described, and so on. When the word Halt is given, the left foot will be closed to the right, as on the word Two. Caution, – Right Close, judging the Time. Right Close, Quick – March. On the word March, each man will carry his right foot 12 inches to the right, and instantly close his left foot to it, thus completing the pace; he will proceed to take the next pace in the same manner: shoulders to be kept square, knees not bent, unless on rough or broken ground; the cadence is that of quick time. The direction must be kept in a straight line to the flank, neither inclining to the front or rear. On the word Halt, the men will complete the pace they are taking, and remain steady. Soldiers will be practiced in closing to the left by Numbers, and judging the Time, in like manner. Soldiers will also be practiced in taking any given number of paces to either flank, and then halting without word of command; the command to be given thus, Three paces Right Close, Quick – March. 22. Turning when on the March. Soldiers will be practiced in turning to the right or left, in making a half turn to the right or left, and in turning to the right about, on the march. Turning to the Right, and then to the Front. – On the word Turn, which should be given as the left foot is coming to the ground, each soldier will turn in the named direction, and move on at once, without checking his pace. On the word Turn, which should be given as the right foot is coming to the ground, each soldier will turn again to the front, and move on without checking his pace. Turning to the left, and then to the Front. – Soldiers will turn to the left in like manner, the word Turn being given as the right foot is coming to the ground; after which they will turn to the front, the word Turn being given as the left foot is coming to the ground. A soldier will always turn to the right on the left foot; and to the left on the right foot. If the word Turn is not given as the proper foot is coming to the ground, the soldier will move on one pace more and then turn. Making a half Turn to the Right, or Left. – Soldiers will also be practiced in making a half turn to the right or left, and then moving on (without checking their pace) in a diagonal direction, taking up fresh points, at once, to march on. Turning to the Right, or left, about. – Soldiers will also be taught to turn about on the march, which must be done by each man on his own ground, in three paces, without losing the cadence. Having completed the turn about, the soldier will at once move forward, the forth pace being a full pace as before. S.23. Directing and Reverse Flanks. As explained in the Definitions. 24. Formation of the Squad in Single Rank. At this stage of the drill, a few soldiers will be formed in single rank without intervals, that is, nearly touching each other. Each man is allowed a space of 24 inches. The right-hand or left-hand man being first placed, the remainder will fall in, in line one after the other, closing lightly towards him, turning the elbow slightly outwards soldiers must be carefully instructed in “The Touch,” as in this formation it is the principle guide when marching. Each man when properly in line should be able to feel his right or left-hand man at the elbow. The body must be preserved in the position described in S.1. When a squad in single rank is required to drill with intervals, the instructor will instruct the odd numbers to take one place forward, even numbers to step back one pace. Soldiers will first be taught to dress man to man, then together. In dressing, each soldier will glance towards the flank to which he is ordered to dress, with a slight turn of the head, as directed in S.3: he must carry his body backward or forward with the feet, moving to his dressing with short quick steps: bending backward or forward must be avoided; his shoulders must be kept perfectly square, and the position of the soldier, as described in the preceding Section, retained throughout. Two Men on the right and one on the left, a pace and a half to the Front. Slow – March. Dressing Man by Man. – Preparatory to teaching a squad to dress by the right, the instructor will order the two men on the right, and one on the left, to take a pace and a half to the front; having completed his pace and a half, the right-hand man will take four side paces to his right; and the points thus placed will raise their right arms from the elbow, at right angles to their bodies. Man by Man, by the Right – Dress up. The instructor, having ascertained that the points are in line, will order his squad to dress up man by man. The third man from the right will take up one pace to his front with the left foot, and shuffle up into line in the manner already described: as soon as he is steady, the next man will proceed in like manner, and so on to the left. The faces of the men, not their breasts or feet, are the line of dressing. Each man is to be able just to distinguish the lower part of the face of the second man beyond him. When the instructor is satisfied that the line is correct, he will give the words Eyes Front, on which the men will turn their heads and eyes to the front, the three points will drop their hands, and the right-hand man will close on the squad. In like manner the squad will be taught to dress up, man by man, by the left; also to dress back, man by man, by the right and left. Dressing together. – The men must next be taught to dress forward and backward, taking the pace together, but shuffling up or back in succession, the same points being given as in dressing man by man. The words of command will be Squad, By the Right (or Left) – Dress up, or By the Right (or Left) – Dress Back. Dressing without Points. – When soldiers are on the alignment they have to occupy, and their dressing is simply to be corrected, the words Right (or left) Dress, or after the word Halt, the word Dress only, will be given, on which they will shuffle up or back to their places successively, commencing with the man on the flank from which they are dressed. When no man is placed for that purpose, the instructor should invariably fix upon some casual object on which to dress his line. It will be found most useful to accustom men to dress on an alignment not parallel or perpendicular, but oblique, to any well-defined adjacent line, such as the side of a square parade ground. The soldier will next practice in single rank, judging the Time, the turnings he has been taught by numbers. Men are never unnecessarily to stand turned to the rear. 27. Marching to the Front and Rear. The soldier will next practice in single rank the different marches and varieties of step which he has learnt singly. Or in squad; the same general rules being observed. Before a squad is ordered to march, the directing flank must be indicated by the caution, By the Right, or By the Left. During the march, care must be taken that neither the head nor eyes are never turned towards either flank; that the dressing is kept by the touch; and that the shoulders are kept perfectly square, and the body steady. The squad will first be taught to march straight to the front, both by the right and left, in slow and quick time; it will then be practiced in all the varieties of step, and in marking time, in both cadences; after which it will be exercised in the double time. The soldier will be practiced in changing the pace, without halting, from slow to quick, and from quick to slow time; also from quick to double, and from double to quick. Before the executive word Slow, Quick, or Double, the caution Break into Slow (Quick or Double) – Time should be given. In breaking into quick, on the word Quick, the arms will be dropped and the fingers extended. The instructor should occasionally remain halted in rear of the man on the directing flank; and, by fixing his eyes on some distant object, ascertain if the squad is marching straight to its front. When a soldier finds himself a little behind, or before the other men of his squad, he must be taught to recover his place in the rank gradually, and not jump or rush to it, which would make him unsteady and spoil the marching of the rest of the squad. 28. A Single Rank at the Halt, changing Front. Right – Wheel. Slow – March. By Wheeling. – On the word March, the right-hand man, called the pivot man, will mark time, turning gradually with the squad, to the new front; the remainder will step off, the whole turning their eyes to the left (the wheeling flank), except the left-hand man, who will look inwards, and step the usual pace of 30 inches, the other men regulating their length of pace according to their distance from the pivot flank. During the wheel, each man must touch lightly, as explained in S. 27, towards the pivot flank, keeping his shoulders square in line; crowding must be carefully avoided; each man must yield to any pressure that may come from the pivot flank, and resist all pressure coming from the other flank. On the word Halt, which may be given at any period of the wheel, the men will halt and turn their eyes to the front; on the word Dress, they will take up their dressing by the right, as described in S. 25, No. 3. On the word Front, the men will turn their heads and eyes to the front. A squad will wheel to the left in like manner. Nothing will sooner tend to enable the recruit to acquire the length of pace proportioned to his distance from the pivot, than continuing the wheel without halting for several revolutions of the circle. When men are required to wheel to the rear of the alignment the occupy, they will be turned about, and then wheeled as above directed, receiving the words Halt, Front, – Dress, followed by Eyes – Front, when in position. After wheeling has been taught in slow time, it will be practiced in quick and double time. 2, By File formation. – On the word Form, the right-hand man will turn to the right; the remainder will make a half turn to the right. On the word March, all, except the right-hand man, will step off; each man, glancing to the right, will move, at the usual length of pace, by the shortest line, to his place in the new front, and take up his dressing by the right. On the word Front, the men will turn their head and eyes to the front. A Squad will form to the left in like manner. This formation will be practiced in double was well as in quick time. S.29. A Single Rank, on the March, changing Direction. On the word Wheel, the men will wheel to the right as explained in S. 28, No.1; the pivot man turning gradually with the squad. On the word Forward, the whole will turn their eyes to the front and step off at a full pace. The instructor will give his word Forward when he sees that the men are commencing the pace that will bring the squad perpendicular to the direction in which he intends it to move; this may be done at any degree of the circle. In like manner, the squad will be taught to change direction to the left. The Diagonal March. – Plate III, Fig 1. This march will first be taught commencing from the halt, after which the soldiers when marching in line will be practiced in moving diagonally to either flank, by making a half turn in the direction desired. From the Halt. – On the word Turn, the men will make a half turn to the right, and on the word March, each man will step off and move correctly in the diagonal direction, no longer keeping the touch. The right-hand man will direct, and must therefore pay particular attention to his direction and pace. Each of the other men will glance towards the right, and will retain his relative position, keeping his right shoulder behind the left shoulder of the next man on that side. On the word Halt, the squad will halt; and on the word Front, it will turn to its original front. If the diagonal march has been properly performed, the squad when halted and fronted will be found to be in a line parallel to its original position. On the March. – When the squad is marching to the front, and is required to move in a diagonal direction to the right, the word Half Right – Turn will be given, upon which the men will turn half right and move diagonally in that direction, as described from the halt; when it is intended to resume the original direction, the word Front – Turn will be given, on which every man will turn to his front and move forward without checking his pace. In like manner the diagonal march will be practiced to the left, from the halt and on the march. The diagonal march will also be practiced in quick and double time. 31. Marching as in File. Soldiers will first be taught to commence marching as in file, from the halt; after which they must be taught, when marching in line, to turn to either flank as in line. Right (or Left) – Turn. From the Halt. – Soldiers, when standing as in file, must be instructed how to cover each other exactly. The head of the man immediately before each soldier, when he is correctly covered, will conceal the heads of all the others in his front. The strictest observance of all the rules for marching is particularly necessary when marching as in file. On the word March, the whole will step off together, at a full pace, and will so continue to step without increasing or diminishing the distance between each other. No looking down, nor leaning back is to be allowed. The leader is to be directed to march straight forward on some distant objects, the remainder of the men covering correctly during the march. On the words Halt – Front, the soldiers will halt and turn to their original front, and if the marching has been properly performed, their dressing will be found correct. On the March, – On the word Turn, the soldier will turn to the right, and move on as in file. The original direction is resumed by giving the word Front – Turn, on which the soldier will turn to the front, and move on steadily in line. In like manner soldiers will be taught to turn to the left from line and march as in file, and, when marching as in file, to turn again to the front. The rules laid down in S. 22. No. 2, regarding the foot on which the soldier is to turn, must be strictly observed in a squad in a single rank. Marching as in file will also be practiced in quick time, but never in double time. 32. Wheeling as in File. Right – about (or Left – about) – Wheel. The squad, when marching as in file, will be taught to change its direction, by wheeling to the right, or to the left, or to the right (or left) about. The leading man will move round a quarter, or half, of the circumference of a circle having a radius of four feet; the other men following on his footsteps in succession, without increasing or diminishing their distances from each other or altering the cadence, but shortening the pace a little with the inner foot, as they wheel. Plate III, Figs 2,3 and 4. At the Halt, Front Form – Squad. Forming to the Front, at the Halt, – When the squad, marching as in file to the right, is ordered to form to the front at the halt, the leading man will at once halt; the remainder will make a half turn to the left, and form upon him as directed in S. 28, No. 2. Heads and eyes will be turned to the front. Forming to the Front, in Quick Time. When a squad, marching as in file to the right, is ordered to form to the front, the leading man will mark time; the remainder will make a half turn to the left, and form upon him, marking time, and taking up the dressing, as they arrive at their places. As soon as the squad is formed, the word Forward will be given. On the March, Front Form – Squad. Forming to the Front, in Double Time. – When a squad, marching as in file to the right, is ordered to form to the front on the march, the leading man will continue moving on; the remainder will make a half turn to the left, double up to their places, and take up the quick time as they successively arrive in line with the leading man. Rear Form – Squad. Forward. On the March, Rear Form – Squad. Forming to the Rear, in Quick, or Double, Time. – The movement will proceed as described in No. 2. or No. 3.; except that the men will make a half turn to the right, and form to the right of the leading man. Forming to the Right. – When marching as in file to the right, and ordered to form to the right, the leading man will wheel to the right, take two paces to his front, and halt; the remainder will form in succession on his left, and be dressed as they get into their places. The word Eyes – Front will be given when the squad is formed. Forming to the Right – about. – When a squad, marching as in file to the right, is ordered to form to the right-about, the leading man will wheel to the right-about, take two paces to his front, and halt; the remainder will march on as in file, wheeling to the right on the spot where the leading man has wheeled, and forming successively on his left, looking to the flank of formation for their dressing. The words Eyes – Front will be given when the squad is formed. When marching as in file to the left, a squad will be formed to the front, or rear, or to the left, or left about, on the same principle as it is formed to the front, or rear, or to the right, or right about, when the right is leading. A squad marching as in file will resume its original front by the words Halt – Front, or Front – Turn. 34. The Side or Closing Step. The side or closing step will now be practiced, the men judging the time, as laid down in S. 21. No. 2. Care must be taken that the shoulders are kept square, and the paces made in a direct line to the flank. Recruits having been thoroughly instructed in the preliminary drills explained in the foregoing Sections, will next be taught the rifle drill as detailed in the Rifle Exercises. A part of each drill with arms will be devoted to the practice of marching as directed in the following Section. Squads with arms will be practiced in the different marches, and variations of step, described in the foregoing Sections; when marching in double time at “The Trail,” the arm that does not carry the rifle will not be raised as directed in S.20. During these practices, great attention must be paid to the position of the recruit. All the instructions relating to the position and movement of the rifle when marching will be found in the Rifle Exercises. SQUAD DRILL, IN TWO RANKS. 37. Formation of Squad in Two Ranks. The squad will now be formed for drill in two ranks, sized as explained in Part II, Gen. Rule II. The men will take their places in succession, commencing from the flank on which they are ordered to form; each rear-rank man will be placed one pace of 30 inches from his front-rank man, measuring from heel to heel, and will cover him correctly, the two men thus placed forming “a File.” When the squad consists of an uneven number of men, the third man from the left of the front rank will be a “Blank” (or incomplete) “File.” The file on the left of the right half squad will always be the centre of the squad. The squad should be drilled, at first, without arms. The front rank will dress as described in S> 25. The rear-rank men will continue looking to their front, and will cover and correct their distances as the front-rank men take up their dressing. 39. Marching to the Front and Rear. A squad in two ranks will be practiced in the marches, and variations of step, which have been taught in single rank. Touch. – The front rank will touch as directed in S. 24. Covering and Distance. – While marching in line, the men of the rear rank must accurately preserve their covering an distance. Blank File while retiring. – When the squad turns to the rear, a blank file, after turning about, will step up and occupy the vacant space in the rear rank. On turning to the front, he will resume his original place. On the word Order, the flank men of the rear rank will step bank two paces in slow time, and turn to the right. On the word March, the flank men will front and raise the disengaged arm horizontally from the elbow, and the rear rank will step back two paces. On the word Dress, the rear rank will dress by the right. Care must be taken not to move the flank men when dressing the rear rank. On the word Front, the rear-rank men will turn their eyes to the front, and the flank men will drop their arms. On the word March, the rear rank will take two paces to the front in slow time. The squad, if drilling with arms, will always be ordered to shoulder before taking open order. These exercises will now be practiced. S.42. Changing Front by Wheeling, or File Formation. The front rank of the squad will wheel, or form (forward), from the halt, or wheel on the march, according to the instructions laid down in S. 28 or S. 29. The rear-rank men, in wheeling, will follow their front-rank men, keeping their proper distances, and covering; in forming, they will preserve their diagonal position. The diagonal march will be practiced in two ranks, in the manner described in S.30. In addition to the instructions there given, the rear-rank men must be cautioned to preserve their relative positions with their front-rank men, in order that they may be found to cover correctly when they are halted and fronted. 44. File Marching, wheeling in Files, and Files forming Squad. File Marching.- File Marching will be practiced as laid down in S. 31, care being taken that the rear-rank men dress correctly by their respective front-rank men. Wheeling in Files.– Wheeling in files will be performed as laid down in S. 32; the inner rank must step rather shorter during the wheel, especially with the inner foot. If a squad is halted, or ordered to mark time, when only some of the files have wheeled into the new direction, the remainder should be taught to cover off, if required; by the diagonal march on the words Rear files, Cover; if the word Front is to follow the word Halt, the rear files need not be ordered to cover, but will move to their places on the word Dress. Files forming to the Front, or Rear.- The front-rank men of a squad marching in files will form to the front, as laid down in S. 33; the rear-rank man of the leading file will move into his place as soon as there is room for him; the other rear-rank men will preserve their relative position with their front-rank men. In forming to the rear, the rear-rank men will act as laid down above for the front rank, and vice versa. 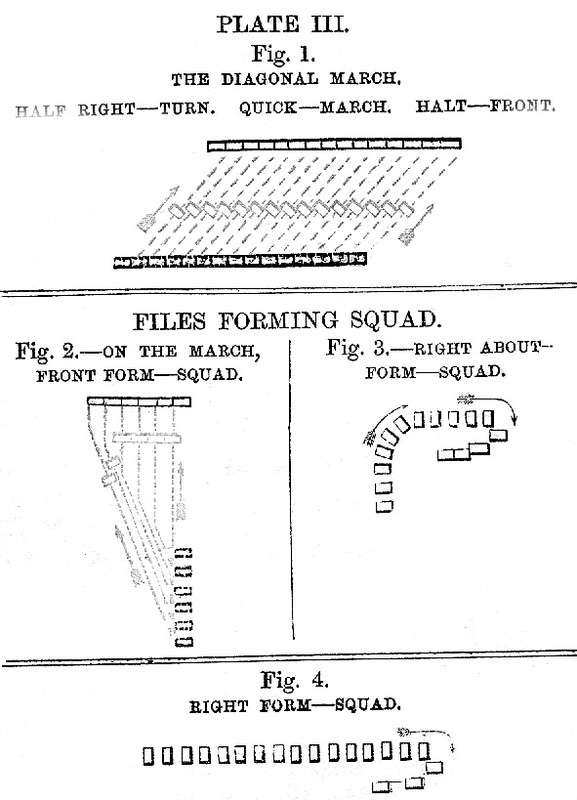 Files forming to the Right, or Left, or to the Right or Left about.- In these formations, the rear rank will form as described in S. 33; the front-rank men will move round their respective rear-rank men, and form successively in front of them. A squad marching in files will resume its original front by the word Halt- Front, or Front- Turn. Figs. 1, 2, and 3. The four men composing a right and left file will be considered as comrades in the field, and will act together, not only in forming fours, but on other occasions; they should therefore take notice of each other when they are told off. The squad should now be made up to eight or nine files, and numbered from right to left; and it must be explained to the men that the odd numbers are right files, and even numbers left files. But in order that the left four may always be complete, when there happens to be an odd number on the left of the squad, the left file but one, although an even number, will be a right file, and the left file of the squad, although an odd number, will act as a left file; in this case the third file from the left, being a right file without a left file, will be called an “Odd File,” whether it is complete or blank. At the Halt.- On the word Fours, the rear rank will step back one pace of 18 inches. On the word Deep, the left files will take a pace of 24 inches to the rear with their left feet, and a pace of 24 inches to the right with their right feet. On the word Front, the left files will move up in line with the right files, by taking a pace of 24 inches to the left with their left feet, and a pace of 24 inches to the front with their right feet; the rear rank men will then close up to their proper distances from the front rank, by taking a pace of 18 inches to the front with their left feet. On the word About, the squad will turn to the right about, and the left files will form on the right files, by taking a pace of 24 inches forward with their right feet, and a pace of 24 inches to the left with their left feet. On the word Front, the squad will turn to the right about, and re-form two deep as already described. On the word Right, the squad will turn to the right, and the left files will form on the right of the right files, by taking one pace of 24 inches to the right with their right, and one pace of 24 inches to the front with their left feet. On the word Front, the squad will turn to the left, and re-form two deep as already described. On the word Left, the squad will turn to the left, and the left files will form on the left of the right files, by taking one pace of 24 inches to the left with their left feet, and one pace of 24 inches to the rear with their right feet. On the word Front, the squad will turn to the right, and re-form two deep as already described. On the March. – A squad on the march will be taught to form fours on the words Fours-Deep, Fours-Right, and Fours-Left; in these formations the left files will move precisely as when forming from the halt, the right files marking time two paces to enable them to do so. On the word Fours, the rank in rear will step short two paces; if the word Deep follows, the right files will mark time two paces, while the left files move to their places in fours; if the word Right, or Left, follows, the squad will first turn in the direction ordered, after which the right files will mark time two paces while the left files move to their places. When moving to a flank in fours, on the words Half Right (or Left)-Turn, each man will make a half turn to the ordered flank, as in the diagonal march. 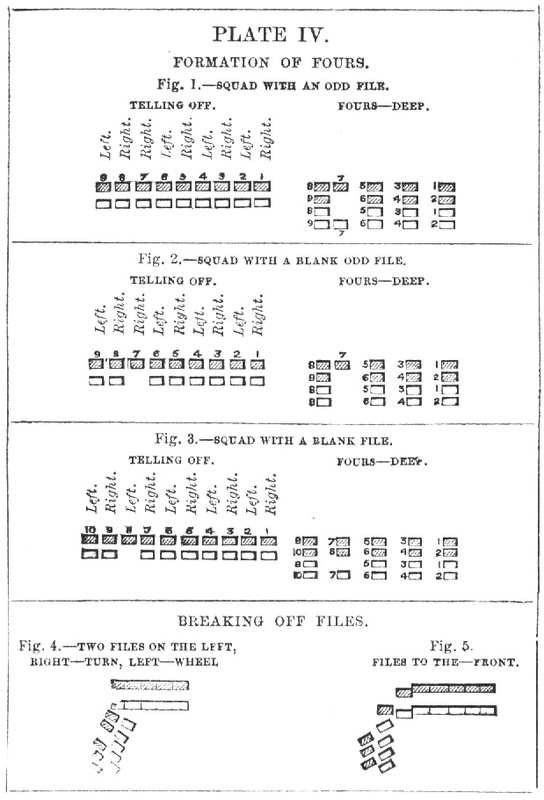 When moving, diagonally or direct, to a flank in fours, on the words Front (or Rear)-Turn, the men will turn as ordered, and then form two deep without further word of command, by the right files marking time two paces, while the left files get into their places, and the rear rank regains its distance. 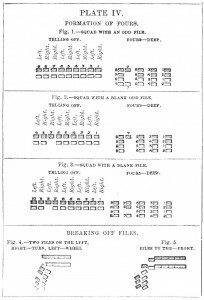 A squad moving to the front or rear, or to a flank in fours, may be ordered to Form Two-Deep, on which the left files will fall back, or step up to their places in file, and the rear rank will close on the front rank, the right files marking time two paces. A squad moving to a flank in file may be ordered to form Fours-Deep. On the word Fours, the rear rank will incline from the front rank by a lengthened step in the diagonal direction, and on the word Deep, the left files will move to their places in fours, the right files marking time two paces. A squad moving to a flank by the diagonal march may be ordered to form fours to that flank. On the word Right (or Left) the men will turn into file; they will then form four deep without word of command. On the order to four fours while marking time, the rank in rear will step back a pace of 18 inches, on the word Fours. 46. Fours Wheeling, and Forming Squad. Wheeling. –A squad moving to a flank in fours will wheel to the right or left, or to the right (or left) about, in the same manner as it wheels in files; each four wheeling successively round the same point. When the word Forward is given during a wheel, the leading four will march straight forward in the direction in which it is then turned; the remainder following. If the squad is halted, or ordered to mark time, when only some of the fours have wheeled, the remainder will move as directed in S. 44, on the words Rear Fours, Cover. Forming to the Front or Rear, to the Right (or Left), or to the Right (or Left) about.- When a squad moving in fours to a flank is ordered to form to the front or rear, to the right (or left), or to the right (or left) about, it will at once form two deep, and then proceed as described in Ss. 44 and 33. 47. A Squad formed in Fours closing on a Flank, or on the Centre, and Reforming Two Deep. For the following practices 10 or 12 files are required. On the Right (Left, or Centre), Close. Quick-March. A Squad having formed four deep, will be taught to close on the right, left, or centre; the four men on the named flank, or in the centre, standing fast, the remainder closing on them by the side step. From the Right (Left, or Centre), Re-form two Deep. Quick-March. In re-forming two deep, on the word March, the four men on the named flank, or in the centre, will stand fast, the remainder will open out from them by the side step, and the left files will move up to their places in line in succession as the intervals are opened for them; the rear-rank men will step up to their proper distances at the same time. These formations will also be practiced on the march. 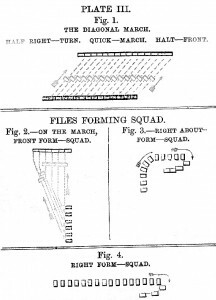 On the word On the Right Left, or Centre) Close, the files on the named flank, or in the centre, will move steadily forward at the stepping short pace, the remainder will close on them by the diagonal march; when all are closed, on the word Forward the squad will move on with a full pace. On the words from the Right (Left, or Centre), Re-form Two Deep, the file on the named flank, or in the centre, will move steadily forward at the stepping short pace; the remainder will incline outwards by the diagonal march, and the left files will move up into the intervals, in succession, as they are opened up for them, the rear-rank men regaining their proper distances at the same time: when completely formed in two deep, on the word Forward, the squad will move on with a full pace. Three Files on the Left, Right-Turn. Left-Wheel. On the word Turn, the named files will turn to the right, and on the word Wheel, they will wheel to the left, following he left flank of the remainder of the squad. Two Files on the Left, Right-Turn. Left-Wheel. On the word Turn, two more files will turn to the right, and on the word Wheel, will wheel to the left, following the left flank of the remainder of the squad; the three files already in rear will mark time, then incline to their right by the diagonal march, and follow close in rear of the two files last broken off. Plate IV, Fig. 4. Three Files to the –Front. On the word Front, the named files will make a half turn and double up into their places in line; the remaining files in rear will incline to the left by the diagonal march, and step out till they cover the two files on the flank. Two Files to the –Front. On the word Front, the two remaining files will make a half turn to the left, and double up into line. All files may be brought to the front at once, by the words Files to the Front. Plate IV, Fig. 5. Files that are broken off must lock up well, that they may not interfere with others who may be following them. The Recruits having been thoroughly instructed in the foregoing Sections, will next be taught to move in extended order. It should be clearly explained to them that the object of so moving is to enable the soldier to take advantage of cover, and thus to inflict the greatest loss upon the enemy with the least amount of danger to himself. They should be instructed to avail themselves, for their protection, of the slightest inequality of ground, and the smallest patch of cover, and how to make the best of it; also how, in advancing or retiring, to run or creep from one point of cover to another without unnecessary exposure. When the recruits have made sufficient progress, one squad should be opposed to another, in order that the men may more readily see and judge for themselves the errors committed. Men in extended order at the halt, if not ordered to kneel or lie down, will stand at ease; on the last executive word they will come to attention, and proceed with the ordered movement. In extending, as a general rule, the front-rank man will keep the direction, the rear-rank man will regulate the interval. In extended formations, each file (or man in rank entire) will be considered to occupy a space of 30 inches. In extending for attack, four paces will be allowed for each file, i.e., an interval of three paces in addition to the pace occupied by the file; and the extension will always be from a flank. When extending for skirmishing, the interval will be increased according to circumstances; and the extension made from a flank, the centre, or any named file. The number of paces will in either case be specified in the caution of the instructor. (For the Attack.) From the Right (or Left), Four Paces, Extend. (For Skirmishing.) From the Right (Left, Centre, or No. _ File), _ Paces-Extend. From the Halt. – The file on the named flank, or the centre or named file, will stand, kneel, or lie down as ordered. The remainder will turn outward, and step off in quick time, covering correctly without opening out. As each file completes the fourth pace of extension (or gains the ordered interval) it will halt, front, and stand at ease, or kneel or lie down, as may have been ordered for the file of extension. On the March. – The file on the named flank, or the centre or named file, will continue to move straight forward in quick time; the remainder will make a half turn in the required direction and will turn to their front as they gain their intervals in the alignment, the whole keeping in line with the directing file. If the squad is moving in quick time the extending files as they make the half turn outwards, will break into double time; if the squad is moving in double time, they will quicken the pace, resuming the original time in each case, as they turn to the front. To _ Paces from the _ Extend. Increasing intervals between Files. – If men in extended order are directed to increase the intervals, they will open out from the named file as described in No. 1 or 2. No dressing, or correction of intervals, will be permitted at the halt; the instructor will simply point out the fault any man may had committed, without allowing him to move. All corrections will be made when the squad is in motion. From the Halt. – The named file will rise and stand at ease. The remainder will rise, turn towards it, and close in quick time, halting, fronting, and standing at ease as they arrive at their places. The file on which the squad is to close may be turned in any direction; the remainder will then form up in the same direction. On the March. – The named file will continue to move on: the remainder will make a half turn towards it, and close in double time, turning to the front, and resuming the quick, as they arrive at their places. If the squad is closed while retiring, it will move as above, continuing to retire rear rank leading. Squad – Advance or Retire. Advancing. – The men will move off in quick time. Retiring. – The men will turn to the right about, and step off in quick time. The intervals will be kept from the centre. When men extended are in movement and the Halt is ordered, they will halt (or halt and front) and stand, kneel, or lie down, as ordered, taking advantage of any cover. 52. Moving to a Flank. Right (or Left) – Incline. The squad will at once make a half turn, and move to the flank indicated, until ordered to resume their original direction to the front or rear, by the word Advance or Retire. If the Incline is repeated, the squad will move direct to the flank. 53. Changing Front or Direction. Right (or Left – Wheel. By Wheeling. – The squad will come gradually round on the principles laid down in S. 28, No. 1; the outer file regulating. The line will advance, regulated by the centre, or halt, as may be ordered. If it is intended to throw back the line, the line will be turned about, and then proceed as above directed. Change Front to the Right (or Left), on the Two Right (or left) Files. Double. By File formation. – If at the halt, the instructor having given the caution, will place the named files in the direction required; on the word Double, the remainder will move across, by the nearest way, to their places in the new alignment. If on the march, the whole will move steadily forward till the word Double; the two named files will then be placed rapidly in the required direction, and the remainder will move as ordered above. If it is intended to throw back the line, or part of it, the caution will be Change Front to the Left (or Right), on the Two Right (or Left) Files, or Change Front to the Right (or Left), on the Two Centre Files (or No. _ and No. _ Files); the movement proceeding as above described. Without Arms. – On the word Turn the men will turn as directed. On the word Dismiss, the front rank will take a side step to the left, and the rear rank take a side pace to the right; after a pause the squad will break off quietly. With Arms. – As directed in the Rifle Exercises. When there is only one rank it will act as a front rank.